Nearly a year ago, I reviewed an album by South Africa's Terminatryx called Shadow, and I really fell in love with the band's visual style, industrial metal sound, and their horror-film approach to their music videos. As is the norm nowadays, I followed them on Facebook and via some innocent internet stalking, I came to discover what a hell of a lot of projects the husband and wife team behind the band are involved with. 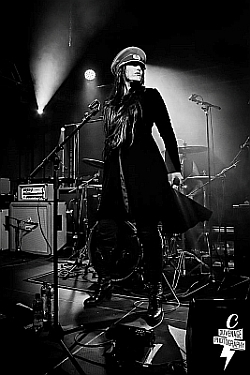 Sonja Ruppersberg, the lead vocalist of Terminatryx, and her husband Paul Blom, the band's bassist, are the driving force behind not only the band, but are also driving forces behind some incredibly cool artistic projects in their country's alternative scene. After a bit of reading, I became very interested in their endeavours because they seemed so varied and, because these endeavours looked so vastly interesting - and all happening in a country I personally would not have associated with the creepy, dark, and edgy kinds of projects I was seeing popping up on their Facebook pages so regularly. I was fascinated, and the seeds for this article were sewn. As I mentioned in my review of Shadow, my first exposure to this band came from discovering their cover of Animotion's "Obsession", a song you no doubt would recognize if you were a sentient being back in the 1980s. It's a great stalker song, and Terminatryx did a video for their version of it that captured the creep factor quite perfectly. In fact, if you watch any of their three music videos, you'll see that creep factor come out in different ways, and you'll also see how horror films have influenced their visual style. Indeed it is Sonja and Paul's love of the horror film genre that motivates their involvement in some of the side projects they have outside of Terminatryx. Their "signature" event, South Africa's Horrorfest, has been going on for 11 years now, starting back at Halloween of 2004. "We like music and movies," Paul tells me in a Skype session the three of us had in May, "so it was just a natural way of us doing these things. We started initially in 2004. We made a short film called Imperfection. We used our music in it, obviously, and used Sonja as the lead in this strange, experimental little flick about a woman who goes out and causes a little bit of havoc. And then we didn't have anywhere to screen it because there were no weird, underground film festivals in our city, never mind the entire country, and we just decided we wanted to create something ourselves and not just screen our short film but to make it possible for other people who have done something similar or want to do something similar but don't have a platform for it. So we got a couple of movies together and a bunch of short films and from there each year word spread." Indeed word did spread, and soon enough they were receiving more submissions - especially from abroad - that they could screen during Horrorfest. Recently, they've had over eight hours of short films to screen, which is about half of what they receive in submissions. "We can't screen them all," Paul says, "because we only pick the best ones." Out of the Horrorfest, which now goes on for 10 days in Cape Town, the couple also formed one of their musical side projects, The Makabra Ensemble, in which, with a mixture of instruments, Sonja and Paul and some other friends - Simon and Sean from a band called Lark, and a violinist friend, Matthijs - play live original soundtracks to old black and white, silent horror films. They have done 10 of these film scores, including Nosferatu, Phantom of the Opera, and The Cabinet of Doctor Caligari. The response has been very positive, and the musicians were invited to play one of the soundtracks at South Africa's largest rock festival, Oppikoppi, which is Afrikaans for "on the hill." Additionally, their score for Nosferatu has been released on DVD, alongside some of their Terminatryx stuff. There are plans to do more recordings for DVDs of these silent film soundtracks, time permitting. "Time permitting", however, is something Paul and Sonja appear to have little of. They are incredibly busy and have day jobs just like the rest of us, and Sonja goes to school as well. Their Horrorfest has evolved over the years, and now screens feature-length horror films from all over the world, and will include an art exhibit, and has a literary element that has a short story contest. Stories from this contest have gone on to be published. Horrorfest also has a market with vendor stalls. "In general," says Paul, "all alternative things are very slim here in South Africa, from music to movies. Not many people make horror movies or make our kind of music, so that's why we try to push it as much as we can on all fronts. As if one huge film fest wasn't enough, Horrorfest has offspring! The X-Fest is touted as South Africa's "wildest" film festival, and features movies that are extreme, strange, and weird, but not always horror. This festival was created due to a rather interesting submission to Horrorfest, but was deemed a tad on the inappropriate side. So, instead of not showing it at all, it became the inspiration for a whole new festival. "We received this - actually hilarious - pornographic film called the XXXorcist," Sonja relates, "but I said to Paul that we would be putting the Horrorfest brand in jeopardy if we screen something like that under that banner, so that's why Paul created, specifically for that film, The X-Fest...We were surprised how many people turned up for it!" But doesn't end there. Oh no. They also added the Celludroid Festival, which screens sci-fi and fantasy movies, and they're adding a music-themed festival called Sound on Screen, as well as Daring Dockies, which is alternative documentaries. "It's always something off-centre," Paul says, and people from all walks of life attend. In terms of musical projects outside of Terminatryx, Sonja also is part of a group called A Murder, with her friend Nerine, who plays classical guitar, and the aforementioned violinist, Matthijs. Sonja, obviously, is the vocalist, and they perform folky music with a dark edge - both original and a couple of covers. They plan on having something recorded or some live performances under their belts by the end of this year. "It's good vocal training," says Sonja, "and it's also a great creative outlet for me outside of Terminatryx, so I'm really enjoying it." As for Terminatryx itself, the foursome manages about one gig or so every month or two, and recently just played their first under 18 shows, which Paul and Sonja were happy to do because it helped expose a younger audience to metal and to music they might not otherwise have been exposed to since metal bands often play in clubs with age restrictions. 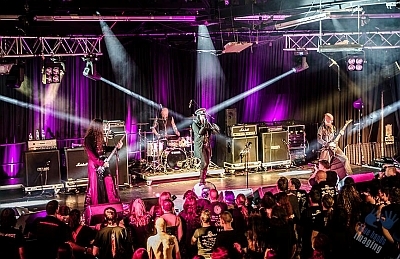 The metal scene, according to Sonja, is probably the biggest alternative scene in the country, but the South African metal scene is indeed quite underground still, though it does thrive in Cape Town and bigger centres like Johannesburg. It consists of mainly -core bands and some black and death metal bands. The country does have a few metal festivals, one in the summer, SummerFest, and one in the winter, WinterFest, which are well-attended. Additionally, there is Witchfest, Africa's biggest metal festival, held in Johannesburg. Terminatryx played there this year, and Sonja said it was packed despite crappy weather the night before the international acts took the stage. "I was quite surprised with the vigour and the amount of people that were still going strong. Those international bands got the most warmest reception I think that they could ever have got in South Africa, and I'm very proud of that stage and to be part of that scene. And to me, that's an indication of a scene that is definitely growing and absolutely thriving." There is the odd promoter that will bring a big-name band to the country, like Ministry, Kataklysm, Behemoth, and Soulfly. Terminatryx appears to be one of the better-known bands in the country, and were even the opening act for Ministry, who came to South Africa earlier in 2015. Their album Shadow has garnered them quite a bit of success, even internationally; the video for the title track, "Shadow", was screened at a Montreal, Canada, film fest this year, and the album was also nominated for the country's burgeoning metal music awards, an event which just saw its second year. I am very grateful to Sonja and Paul for spending some time with me over Skype so we could chat, and I appreciate the fact that I am now more up on the South African metal and alternative scenes. They definitely have it going on! Remember that these folks have 9 - 5 jobs on top of all this extra-curricular stuff, and that they do it for the enjoyment of it all. I have been fascinated by South Africa for quite some time, but now that I know all this other cool stuff is going on there, I'm officially moving a trip there up on my bucket list!